Why do the designs of the Dr Pepper and Squirt soda cans change less frequently (i.e. 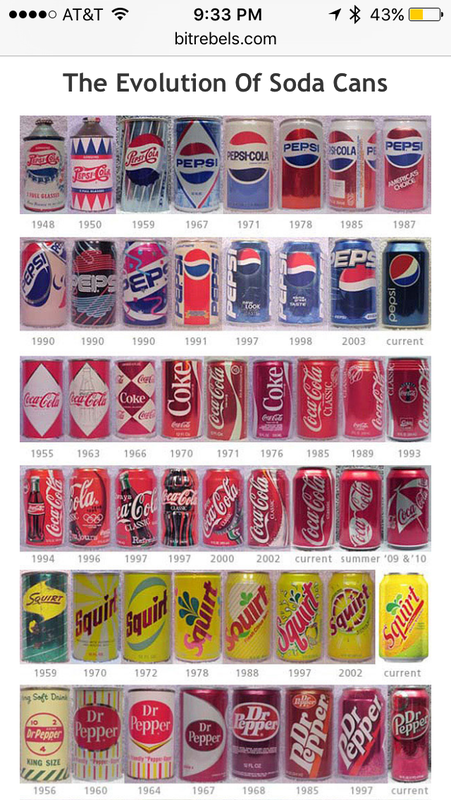 are more stable over time) than the designs of Pepsi and Coke cans? This entry was posted in Economics, Game Theory. Bookmark the permalink. Possible explanations: (1) Lesser brands have lower sales, less market share, hence lower design budget, and less anticipated marginal benefit to justify re-design costs. Less-popular brands are “refreshed” to stay current rather than “re-invented” to look innovative and gain share. “Refresh” takes less cost and effort. Squirt and Dr Pepper are not positioned as “lifestyle-choice” brands and so are less trend-dependent than Coke and Pepsi. (2) See various explanations offered under (1). Notice too that overall sales of soda pop has been in decline (in spite of all these redesigns), so soda companies are fighting each other for slices of a smaller and smaller pie! But the question posed was why Squirt and Dr. P had fewer redesigns than their soda cousins. Yes, I see your point, if the overall pie is getting smaller, then perhaps the absolute $ of the market that the minor-brands own no longer justifies re-designs, while the major-brands still have the $ to spend on it. However, if one looks more closely, even the majoy brands did not re-design with regularity — minor tweaks alternated with the occasional overhaul, with unpredictable timing. And the data provided for Pepsi and Coke started in a much earlier year than the other brands, perhaps enhancing the idea that these brands changed designs more often. It might be that a closer look at the actual designs might indicate that major design changes occurred to each of the brands at roughly the same pace, i.e., the original premise of design arms-race might not hold. I think I will leave this to others to ponder.